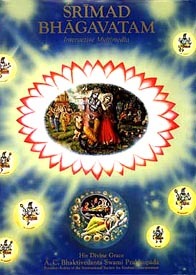 Srimad Bhagavatam 1.2 | eWakening now! The wise say that the truth of reality is known as Brahman, Paramatma, or Bhagavan — the highest, unmanifest cosmic Consciousness. Sages who with wisdom and non-attachment delve deeply into this will see within themselves and this conciousness in pure devotion what they have read in the scriptures. For all types of human, regardless of station, the highest form of practice is found in devotion to God. With this devotion as a focal point for the mind, the Lord within is unveiled to one. — Srimad Bhagavatam Canto I Ch. 2, vv. 11-14. This entry was posted on December 21, 2009 at 2:57 pm and is filed under enlightenment, yoga. You can follow any responses to this entry through the RSS 2.0 feed. You can leave a response, or trackback from your own site.